This update is long overdue but the reality is that posting updates from the WordPress android app is painful at best requiring multiple attempts and lots of swearing. So in the meantime I have been posting to my Facebook profile which can be found here: profile. I’m trying to create a Facebook page too: link – which I think only my mum follows at the moment. 🙂 If anyone knows how to make posts to both Facebook and WordPress simultaneously please tell me! Since San Cristóbal de La Casas: I’ve climbed 7 volcanoes (including the highest in Central America), had 4 weeks of Spanish schooling at the schools of Pop Wuj and El Quetzal (both highly recommended) and stayed in San Pedro (Lago Atitlan) for a few days. After Quetzaltenango (also known as Xela) I cycled the 175 km (very hilly: a big day!) to Antigua where I left my bike to visit the ruins of Tikal in the far north and then the famous turquoise pools of Semuc Champey. Leaving my bike in Antigua was a tough decision and I stared longingly out the window of our toilet-smelling non-air conditioned bus as we twisted and turned our way down vast mountain sides. With more time I would have ridden it, but as it is I’m going to be very pushed to reach Tierra del Fuego before next winter. More detailed posts on the above to follow shortly. 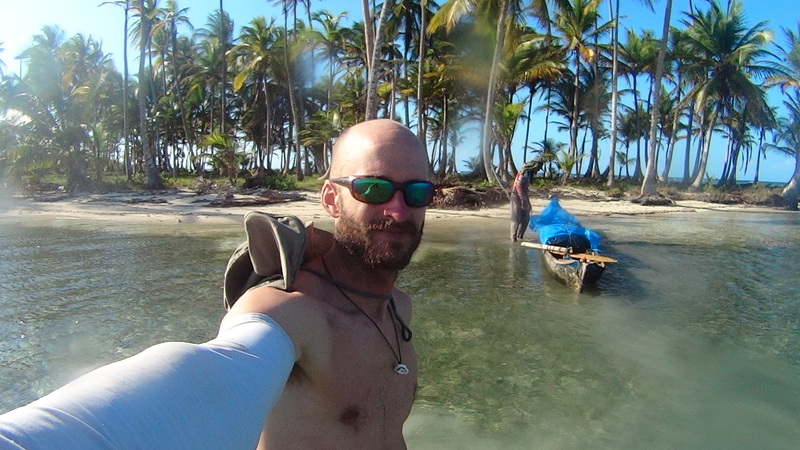 In the meantime I have a couple more days here before I head on to El Salvador! 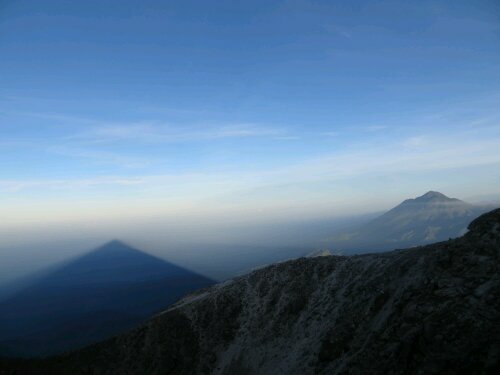 Sunrise shadow of Central America’s highest peak (Tajumulco) taken from the summit. The second highest peak is to the right (Tacaná). You can easily simultaneously publish to Facebook, Twitter, tumbr etc On your WordPress account go to the DASHBOARD (will probably have to be set up on a proper computer, not sure you can set it up on a phone) and then select SETTINGS then SHARING and you go through permissions to allow WordPress to share. Its easy I did it recently! Nick, it sounds like you’re still having an excellent journey. What did you think of Xela? One of my favorite travel memories is Semuc Champey, wasn’t that absolutely beautiful?! Did you happen to go to the Grutas de Lanquin–the bat caves? That was another favorite spot of mine. How’s your Spanish these days? Hi Laura, good to hear from you! Still really enjoying it, you in China still? Xela was cool, has a lot of character and cheap for learning Spanish. Finding Antigua relatively expensive. Semuc was amazing, really enjoyed the semi-underwater caves right near it (although somewhat hazardous!). unfortunately didn’t have the time for Grutas, but that sounded great too! Too much to see in Guatemala! Amazing for such a small country. Spanish is reasonable, think my ability tripled in one month having been in Latin America for 6 or 7 months prior. Amazing how much work it is to learn a language. would be great to hear your news. Hey Nick, good to get your update. Tried sending you some pics from Cafe Atitlan (to your yahoo address), not sure if they ever made it. Will be following your adventures with interest.